Online Painting Courses - Detailed Oil Painting Instructions on Video. Excellent Online Painting Courses Are Enjoyable and Easy to Follow. 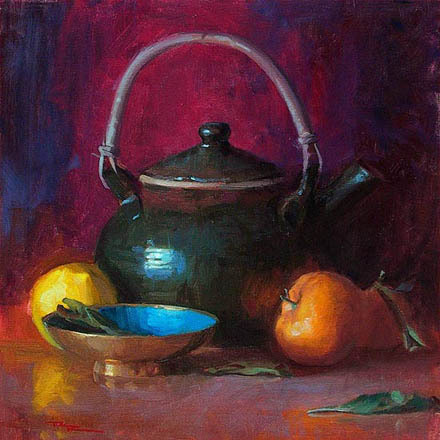 Richard Robinson’s online painting instructions are professionally researched and delivered clearly in such great detail that I am full of admiration for his ability as an artist and as a teacher. I am always on the lookout for products and courses that may be of interest to you. During this research I come across many e-books that, unfortunately, promise much but deliver little. So it was refreshing to find Richard's online painting videos, DVDs and PDF support material, which give me confidence that this young artist really 'knows his stuff' and can pass on those skills in an interesting way. Originally trained as a graphic artist, Richard has pursued a career in fine art since 2002, mostly painting realistic or impressionistic landscapes and seascapes of country New Zealand. 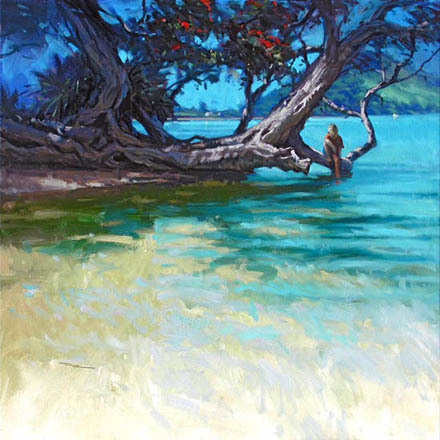 During 2012 he took his young family to Hawaii for several months of painting and teaching. Perhaps some of you managed to join him there? In October 2013 I was delighted to meet Richard in person during a weekend painting workshop at Palm Cove, near Cairns, North Queensland. I felt that I already knew him well through his teaching videos so there were no surprises there. What did fascinate me, though, was how he could paint a beautiful, crisp oil painting of, firstly, a beach scene, then of a group of buildings and trees across from the beach, using a wet-on-wet technique that captured the atmosphere in clear, singing colours. Richard Robinson - 'Northland Summer' - oil on canvas. Richard’s friendly and modest approach, coupled with clearly illustrated steps in the development of a painting will keep you fascinated and makes for a flawless presentation. Once you have practised some of his acrylic or oil painting techniques you can always come back and view the video again to see if you have missed anything. Supporting PDF notes and explanations can be printed out for reference and revision. If you’re unsure whether to purchase one or more of the courses, Richard makes it easy for you by providing a free chapter to try. You can also sign up for his free online painting demonstrations, emailed to you regularly. There is no pressure to buy but, whatever your current ability, it is sure to improve even by just watching these short demos. I have been receiving free videos for a year or so and really look forward to their arrival. A recent lesson even showed how to complete an oil painting while using mostly watercolor techniques! Magic! Here is a very useful tool for creating colour harmonies in your paintings. Learn to see like an artist - then paint like one! “A big part of what I teach in the painting lessons is really about seeing. You'll learn how to see like an artist, which is very different from how most people look at the world. An artist sees by observing relationships - the relationships of color, value, shape and texture. Once you know how to see these relationships more clearly your painting will literally jump ahead from where it is now. Seven lessons or several rolled into one - your choice. Currently there are seven separate lessons (colour, landscape, paint) covering various design elements, as well as a comprehensive one about the business of art , but from time to time Richard combines two or several of them in a special offer, so watch out for these. At first glance I felt rather confused about courses from which to choose, partly because he also includes a choice of drawing and painting lessons by others to supplement his own material. A good place to start exploring what is on offer is to watch the short video, above, then browse Richard’s site, perhaps taking particular notice of his Mastering Color lessons, which he tells me are leading in the popularity stakes. If you do decide to enroll in any of Richard’s classes I would be very interested to hear your comments about your progress as you learn to paint online with him. Tell us of your progress? If you have followed Richard Robinson's online painting instructions please let us know of your progress and whether, or not, you would recommend the courses. Your story (300 - 400 words is best) will appear on a Web page exactly the way you enter it here. You can wrap a word in square brackets to make it appear bold. For example [my story] would show as my story on the Web page containing your story. Do you have some pictures or graphics to add to illustrate your progress? Great! Click the button and find the first one on your computer. Select it and click on the button to choose it.